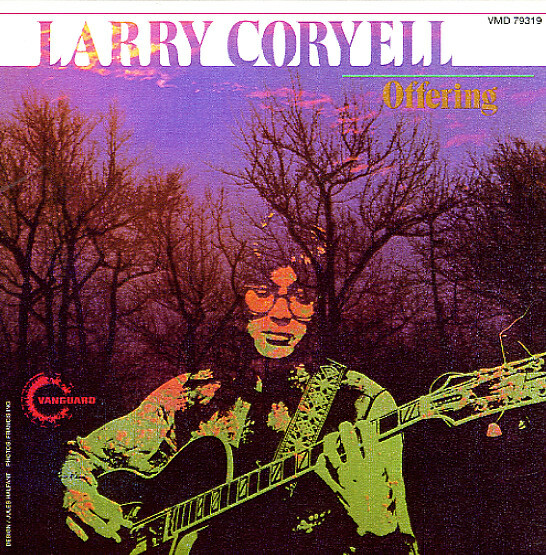 A fantastic record from guitarist Larry Coryell – one that maybe has him shedding some of the more rockish tendencies of his roots, while finding the way forward in a searing, searching style of funky jazz! There's almost a Flying Dutchman sort of righteousness to the record – as Larry mixes the ever-increasing sharpness of his guitar with great soprano sax from Steve Marcus – who himself may well be topping performances on albums under his own name. Bottom energy is driven strongly by Mervin Bronson on bass and Harry Wilkinson on drums – and the group also features lots of great keyboards from Mike Mandel – playing "electric piano with fuzz wah"! Titles include "Foreplay", "Ruminations", "Scotland 1", "Beggars' Chant", and "Offering". © 1996-2019, Dusty Groove, Inc.